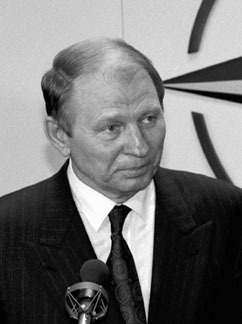 Kuchma was an engineer at Baikonur station, rising to senior management. In 1990 he ran for Ukrainian parliament, and became Prime Minister in 1992, and succesfully ran for President in 1994. His administration was plagued with corruption scandals, and allegations exist that he was involved in the 2000 killing of journalist Georgiy Gongadze (he denies this).